Hackpen Hill, nr Broad Hinton. Wiltshire. Reported 16th July. 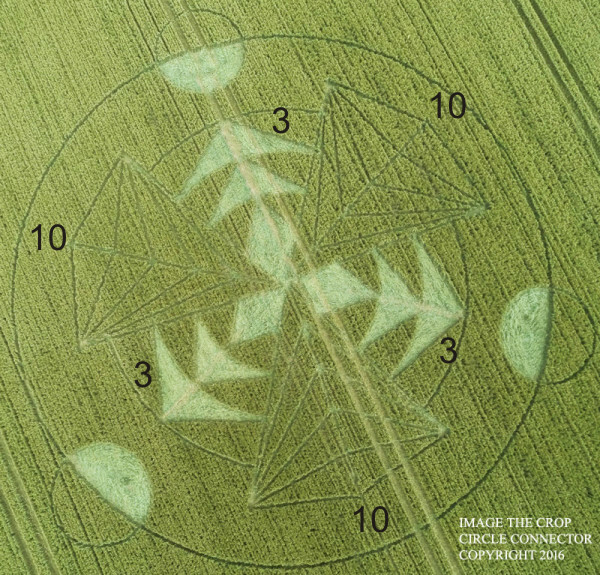 Could the new crop circle at Hackpen Hill reported on the 16th of July be representing information from the 3 pyramids on the Giza plateau and the 3 stars of Orion’s Belt? Let’s have a look. The crop circle is clearly encoding the number 3. 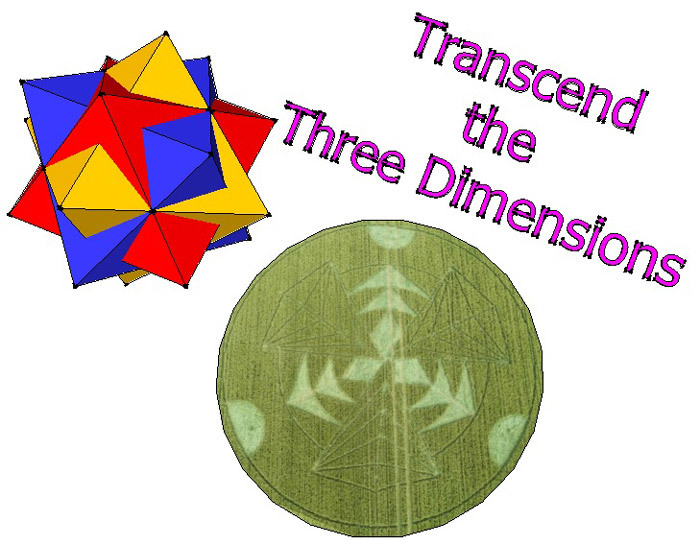 3 tetrahedrons or pyramids, joined at their apexes and the 3 “energy waves” emanating from the apexes in arrow-like formation pointing in the direction of 3 orbs equally spaced on the outer circumference of the circle. Many of us have heard of the theory, originally put forth by Robert Bauval in 1983, that the 3 Giza pyramids are an earthly representation of the 3 stars of Orion’s Belt, Alnitak, Alnilam and Mintaka. In later years, archaeologists have discovers shafts within the great pyramid that point towards the stars in Orion’s Belt. Was some force meant to emanate from the great pyramid directed at the stars in Orion’s Belt? We don’t know but we do believe that the ancient Egyptians associated the Orion Constellation with Osiris, the god of rebirth and the afterlife. There has been speculation that one of the extraterrestrial races visiting the Earth may come from one of the planets associated with one of the stars in Orion’s Belt. 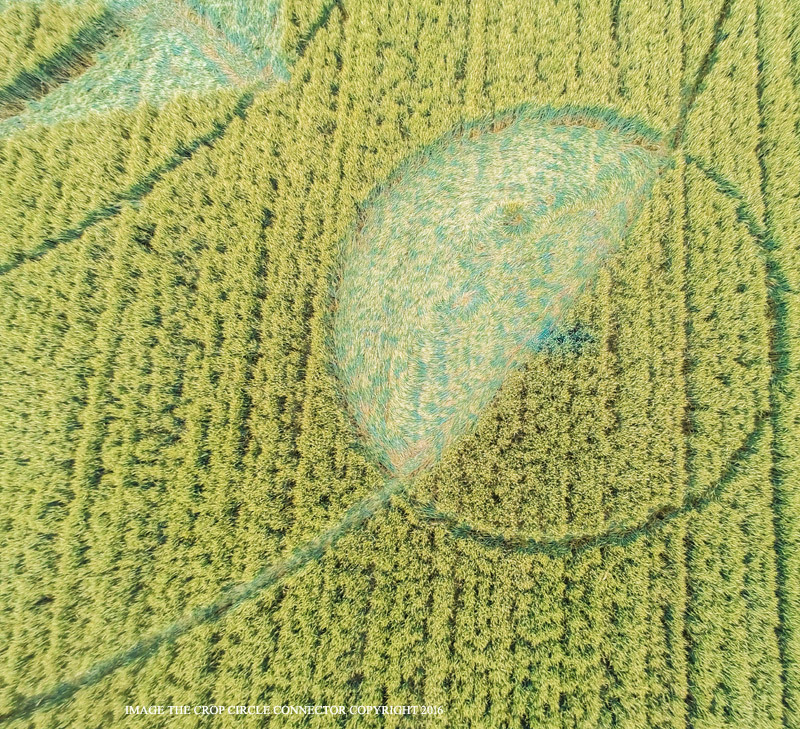 The tramline that runs through the crop circle intersects perfectly with one of the orbs on the outer circumference of the circle but yet is slightly offset from the center of the circle where the 3 pyramid apexes intersect. Could this variation be meant to represent the arc-degree offset of the 3rd star and the 3rd pyramid? Perhaps someone could make the calculation. 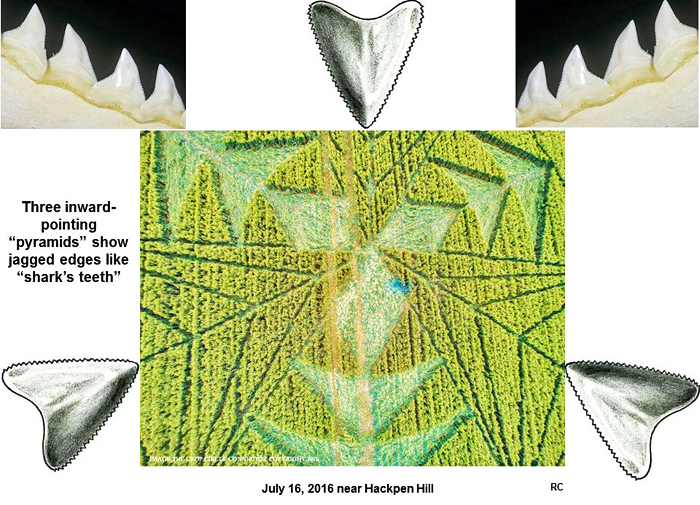 The recent crop circle at Hackpen Hill reported on the 23rd of June, depicting sharks circling around a Triquetra, was created only a few hundred meters away from the new crop circle. Red Collie correctly identified that crop circle as an important one and predicted that a new important crop circle might appear in the field close by, where in August 2012 an important 3 dimensional cubic design was drawn in the same field where the current “Orion” circle is drawn. Finally, if we look at a satellite image of the terrain around the current “Orion” circle, we notice that just to the northeast of the “Orion” circle, on top of the ridgeline, we can see 3 strange perfectly round copses of trees which bear striking resemblance to the depiction of the 3 stars of Orion’s Belt along with an the requisite offset. 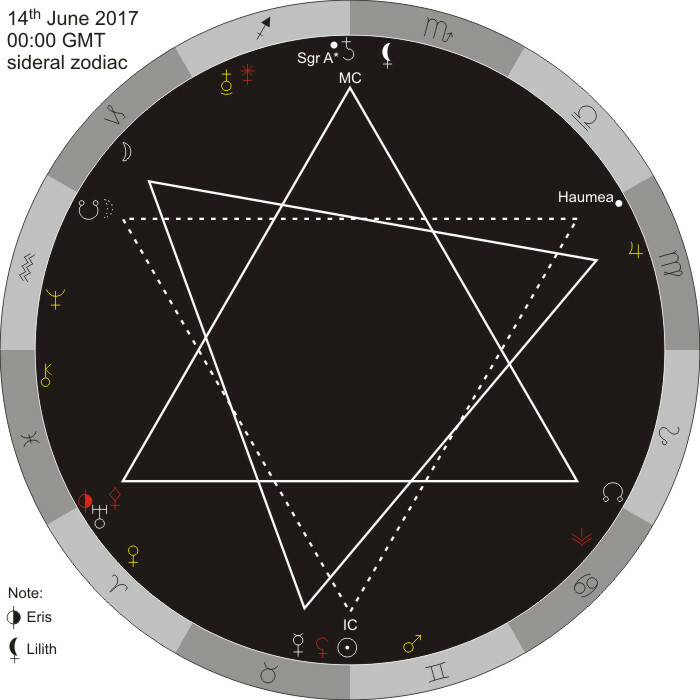 On June 14, 2017, we find a double, but asymmetric triangle. However, we find a double perfect and symmetric triangle on June 14 or 15 if we include the dwarf planet Haumea (dotted triangle). The celestial bodies are very close to the transition to the next sign. On June 15, the moon is also at the lunar north node (dotted moon in figure). - The year 2017 falls 19 × 9 × 30 years after 3114 BC (= -3113 if we include the year 0). The numbers 9 and 30 correspond with the segments of the formation. On April 3 to 4, 3114 BC, a total eclipse occurred. Exactly 5130 sidereal years later is June 15, 2017! 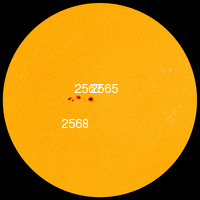 Note that the dates (April 3 and June 15) differ because of the precession of the equinoxes, but the sun is at true equal positions against the background of the constellations of the zodiac. The solar eclipse of April 3, 3114 BC is important in relation to the erection of the World-tree, described by the Mayan civilization and completed on August 11, 3114 BC (proleptic Gregorian dates). The fact that the crop circle makers connect the very near future with the age that began in 3114 BC illustrates that that age will definitely end. For this reason, the formation is near the white horse of Hackpen Hill. In Christianity, in the book of Revelation, Christ rides a white horse out of heaven at the head of the armies of heaven to judge and “make war” upon the earth. Meditate on the cornucopia with you at its center! According to the Mayan calendar, 16th July 2016 is the first day of the Red Moon Wavespell and the first day of the Central Green Castle of Enchantment with major energy “Yellow Human”. The Yellow Castle contunues 52 days, until 5th September 2016. 16th July 2016 is also a day of the White Planetary Wizard Year, which continues until 25th July 2016. Red Moon – the major energy of the current Red Moon Wavespell. In the center of the formation we see three rhombs. Each of them has 4 sides. Each rhomb symbolizes the energy "Yellow Seed” – Solar Seal No. 4. The total number of the sides of the 3 rhombs is 12. Here the number 12 symbolizes the energy “Yellow Human” – Solar Seal No. 12. Between each rhomb and the corresponding Moon are depicted 2 figures, which resemble birds. Each pair of birds symbolizes the energy “White Wind” – Solar Seal No. 2. White Wind is the energy of Spirit – the energy, which inspires us, gives us wings. The three rhombs and the six birds depict the face of the White Wizard. The two upper rhombs are the eyes of the Wizard, the lower rhomb is the nose. Under the nose are the smile and the beard, left and right of the eyes are the eyebrows. On this way is depicted the energy “White Wizard”. We see also three pyramidic grid structures, which resemble funnels or antennas. Each of these funnels/antennas consists of 10 triangles. The middle line divides the grid funnel in two halfs and in each half there are 5 triangles. Here the number 5 symbolizes the energy “Red Serpent” – Solar Seal No. 5. The number 10 symbolizes the energy “White Dog” – Solar Seal No. 10. With this crop circle we are reminded, that during the Central Green Castle of Enchantment we receive the energy “Yellow Human”. It is time to prepare our chalice, in order to fill it with divine cosmic gifts. It is time to prepare our antennas to receive the expanded energies of higher mind. Yellow Human is the grail, the cornucopia, the still place that lies open, receiving the gifts. Be receptive. Yellow Human is preparing your circuits for transformation. Become empty, that your thirst may be quenched by the bounteous gifts poured from the chalice of the spiralling galaxies. Clear your physical vessel in order to prepare for the expanded energies of higher mind. Your chalice of self is being purified through vibrational adjustments in the brain/body system. With this quickening, adjustments are made and your circuits of consciousness are naturally transformed. With this expanded consciousness, your brain/body system is being cleared and fine-tuned so that you can create a sluiceway for the activation and acceleration of cosmic consciousness. This is the foundation and awakening of your light body. The development of the light body involves strong interaction between Spirit and self as you prepare for entrance into the expanded chalice of Essence Self. All the gifts of the macrocosm pour out of the universal cornucopia. Meditate on the cornucopia with you at its center !! Lift the chalice of your self-generated energy vortex to greet the vortex that will descend from above. As an open vessel, prepare a place to receive Yellow Human's gifts. When you flow in unconditional love, all the fruits of the universe rush toward you for benediction. Cordial thanks also to the authors of this crop circle!! What will be the fate of our species, harmony and understanding, or perpetual discord? 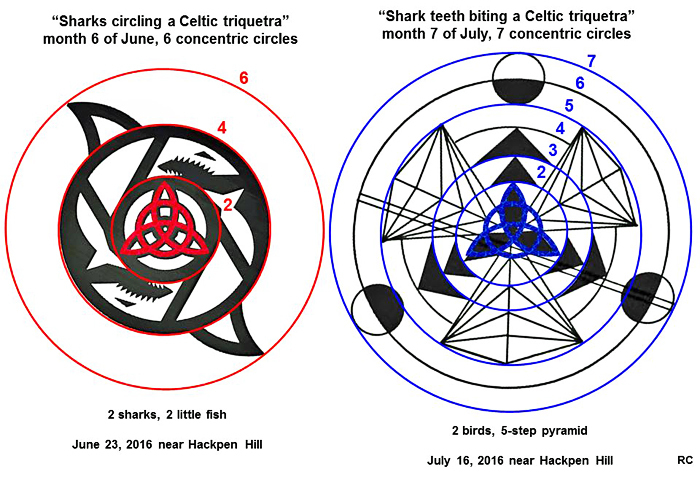 On or about 23 June, two sharks circling a Celtic triquetra appeared on the Ridgeway, Hackpen Hill, evidently, at the precise location of the so-called “Dreamcatcher,” which came down in the summer of 2013 (see Paul Jacobs, The Badger Sett Mystery, Badger-Sett-Mystery . . . one I had the good fortune to visit, by the way; but I digress). Who would disagree? Certainly not Red Collie, who noted that one of the triquetra’s three axes pointed to the field in which a Rubik’s Cube appeared in August 2012. From this, he predicted that a subsequent crop circle might well come down at that location . . . et voila! Furthermore, the realization of Collie’s prediction is hugely important for it suggests the study of the phenomenon is, at last, moving from imaginative speculation to rudimentary understanding for one cannot make accurate predictions without such understanding—what causes crop circles to come into existence, when and why? It therefore seems the circle makers have again invited us (humanity) to solve the puzzle for, evidently, the solution has eluded us, thus far. What could it be? Could this, indeed, be the circle-makers’ hint? Though conjectural, I cannot help wondering if it might not capture their gentle, optimistic hope for humanity—something for us to puzzle out, as it were? Do they ask us to join with them, and rise above deep-seated survival instinct, to cease perpetual circling about, eyeing one another as prey to be eaten, and to realize our higher purpose—divinely gifted to all sentient, self-aware creatures—which revolves around harmony and understanding, vice discord? Furthermore, assuming this to be the case, what will it take for us to realize the divine gift, and be transformed, given the millennia of strife that is our collective history and heritage?! Must a cataclysm descend upon all for individuals to achieve transformation? I wonder? !